Dr. Chloe Wilde is our wildlife biologist. She studied ecology at the University of North Carolina in Chapel Hill. Her favorite topic of study is conservation. 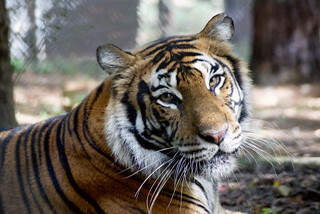 Dr. Wilde is passionate about learning about and teaching others about how they can help wild cat populations, including reducing their use of products with palm oil in them. 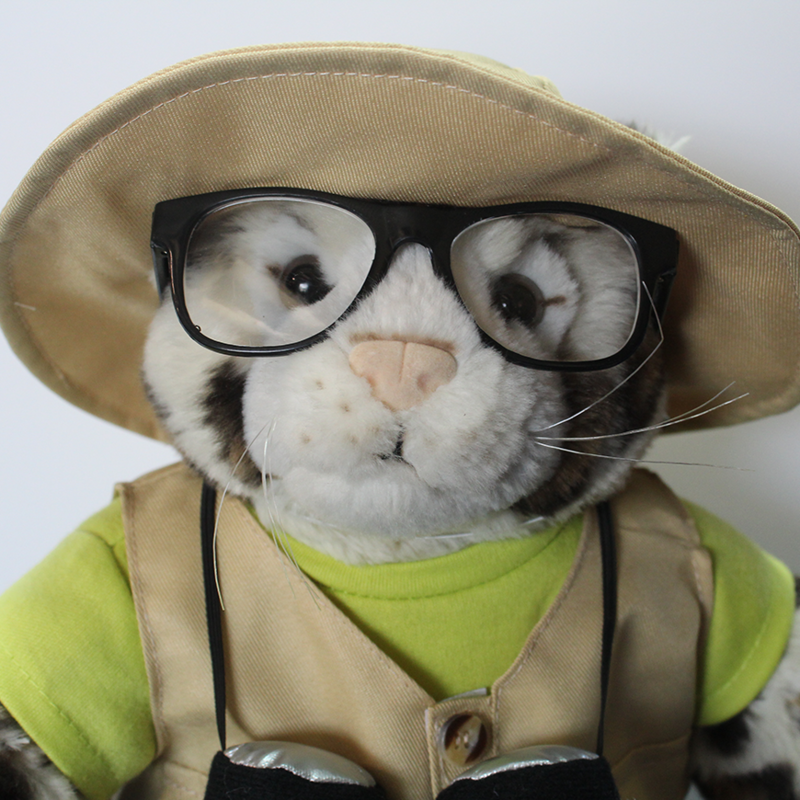 Though Carolina Tiger Rescue does not have any, Dr. Wilde’s favorite animal to study is the clouded leopard. Sometimes I am glad when my job takes me indoors! It is cold in Pittsboro, NC this morning! It’s only 17 degrees here! I know it’s colder in other parts of the country but us clouded leopards do not do so well in the cold! This morning, however, I had the opportunity to visit a local high school for their career day. I love talking to students about my career and the careers of my co-workers at Carolina Tiger Rescue. We have a really cool job, if I do say so myself. We told these high school students how important getting their education is and that if they want to work with animals, a great way to get started is to volunteer! They can volunteer at local animal shelters with dogs and house cats and when they are old enough they could volunteer at a place like Carolina Tiger Rescue! At our information table, we not only told them about the awesome jobs we have, but of course about the amazing animals we take care of! We had a wheel they could spin to earn a prize if they answered a question correctly and had information on how to volunteer at Carolina Tiger Rescue. We also had some pelts from some of our animals who have passed away so we could tell them about why their fur is all different. Did you know that tigers have longer fur than lions because tigers usually live in cooler and wetter environments? Caracals have tawny (reddish-brown) fur to help them blend into the African Savanna! You can learn a lot about an animal just by looking at its fur! 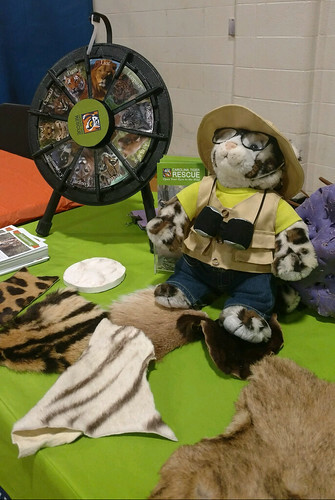 Keep an eye out at your next school event – you never know when myself or my friends at Carolina Tiger Rescue might show up! Also! 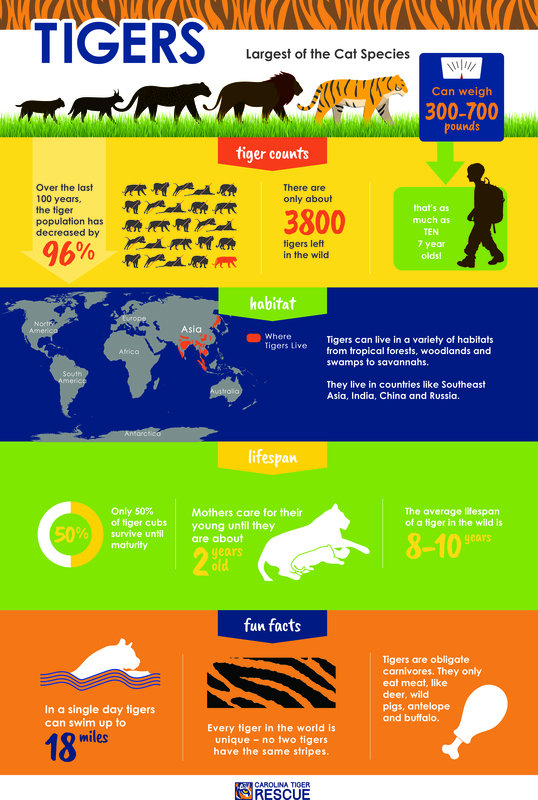 Take a look at this awesome infographic about tigers that we created! It’s information like this about wild tigers that is important to know to help save the species!